Home > Law Books > Treatises > Immigration Law and the Family, 2018 ed. 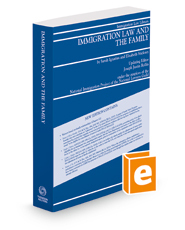 Immigration Law and the Family, 2018 ed. This title also cites and cross-references to applicable statutes, regulations, USCIS and DOS internal operating procedures, and agency correspondence, cables, and newsletters.